Why the Highpoint Rocket 2720SGL? The Rocket 2720 SGL is an ideal SAS / SATA controller to use with VMware ESXi, it is a cost-effective, high-performance PCI-Express 2.0 6GB/s SAS controller. The 2720SGL supports up 8x SATA3 6gbs hard drives and is compatible with large drives above 3TB in size, prefect to use if your not after RAID and wish to use something like Windows Storage Spaces for example, or simply connect a lot of hard drives to a Virtual Machine and have off site backups. I personally dont feel i need a raid setup at home, however i shall leave my reasoning for that to another blog post. When purchasing the card i was unsure if it work when passed through to a virtual machine running on VMware ESXi, however i can confirm the Rocket 2720SGL works perfectly when passed through to a VMware ESXi virtual machine. ESXi recognises the card as a Marvell 88SE9480 SAS / SATA 6Gb/s RAID controller. However despite this please keep in mind the Rocket 2720SGL is not directly usable in ESXi, it can only be utilised when passedthrough to a Virtual Machine. I purchase my Highpoint Rocket 2720SGL from Scan.co.uk who appear to be one of the few retailers in the UK who sell this particular card. In conclusion the Rocket 2720SGL certainly works very well on my ESXi home lab setup when passed through to a Virtual Machine. At just over £100 with support for 8x SATA 3 6Gb/s drives i dont think you could ask for more. Perfect for use in my new 8x bay case that i have recently moved my ESXi server in to. I will be posting a blog up on that shortly, if you have any questions i shall do my best to try help. To answer a couple of questions in the comments, although ESXi recognises this as a Marvell 88SE9480 SAS / SATA 6Gb/s RAID controller, you can not directly make use of the card in ESXi. ESXi will not see the Rocket 2720SGL or any of the drives attached to it. I have had a look around on the internet and no drivers appear to exist to use the Rocket 2720SGL directly in ESXi. 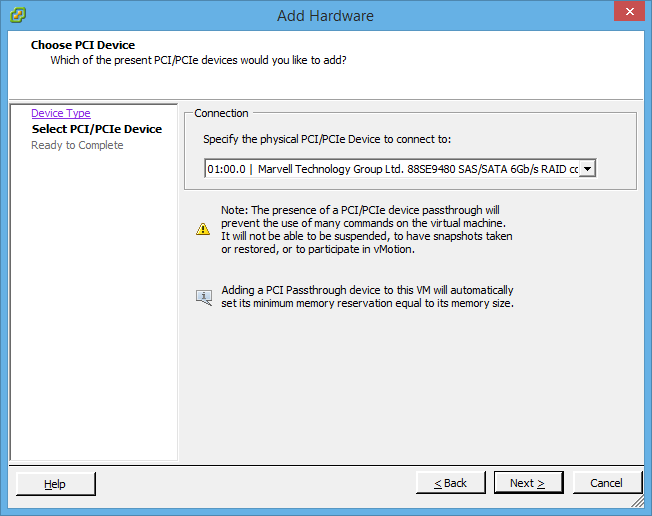 The Rocket 2720SGL will only show up as a PCI device which can be passed through to a virtual machine, when passed through to a VM it does however work great. The Rocket 2720SGL is also not detected by FreeNAS 9.1.1 out the box. Nice concise article. This is just what I have been looking for. I have a home lab running ESXi 5.0, but ESXi doesn’t like the on-board RAID controller on the ASUS P8B-WS board, so I have been running on 250Gb SSD and 3 x 1TB HDD SATA 3 drives, without RAID for about 12 months. I am now at the stage where I want to create a FreeNAS VM with dedicated passthrough RAID controller. The rest of my setup has 32GB RAM, Intel(R) Xeon(R) CPU E31230 @ 3.20GHz. I wanted to future proof the hardware as I use it as a training and test rig, but also want to use it to host media and stream content, etc. 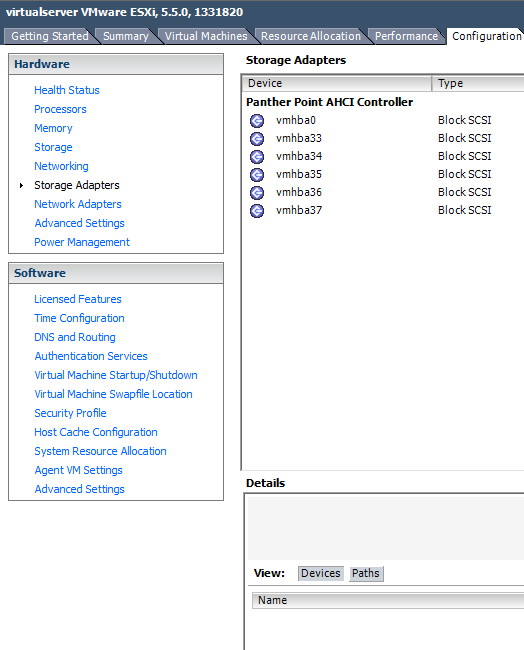 I too have been looking on scan.co.uk and cross referencing against the VMware HCL / forums. I was about to go with the LSI 9240-4I/SGL and run it with a RAID 10 for performance / resilience, as it has no cache, and RAID 5 is reported as being SLOW on that card. However, having seen your article, I am tempted to save some money, and get what I expect to be similar performance (or should I spend the extra £30-ish and go for the LSI 9240-4I?). If the two cards are comparable on performance, then it’s just down to the matter of compatibility and reliability. I notice that Highpoint don’t offer any native ESXi 5.0 drivers, and that it installs as a Marvel controller. Can you tell me if the RocketRAID 2720SGL (Marvel) card, once passed-through from ESXi, is detected and supported under FreeNAS, which runs on Free-BSD? I know that Highpoint say the RocketRAID 2720SGL is supported under Free-BSD, but would like to know if the fact that it is presented as a Marvel controller causes any compatibility issues? Also, I can’t see any evidence of any cache on the RocketRAID 2720SGL. Can you comment on whether RAID 5 is slow on this card? What disk setup would you recommend? I would buy additional HDD to achieve RAID 10, if that offered best performance / resilience. Hi, you would need to spend the extra money as the Rocket 2720SGL is simply a SAS / SATA controller, it does not support RAID which is why its probably cheaper. I did mention raid somewhere, my apologies I have clarified this is what ESXi states, however the Rocket 2720SGL is defiantly not a raid controller. 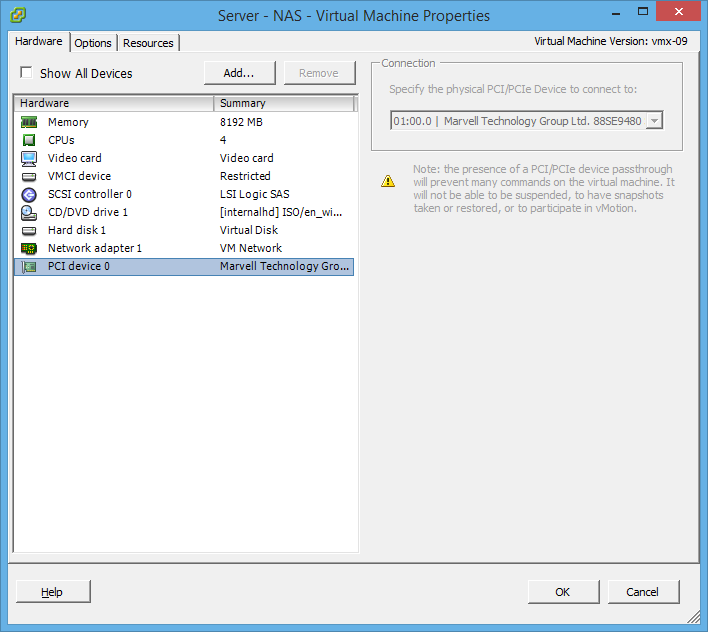 I have created a FreeNAS VM to test this for you, unfortunately the card is not detected in FreeNAS when passed through. I’m unsure if its possible to get it working or not, however it’s certainly a no go out the box. You probably run it in JBOD mode ..
Have you heard about “vSynology” project aka “xpenology”? It’s basically Synology NAS running as ESXi VM. Would you be interested to test if 2720SGL is recognized by vSynology being passed through? 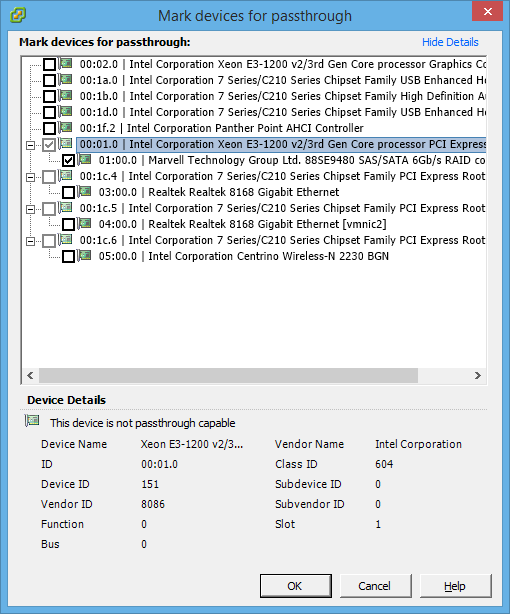 Hi, did the Rocketreaid 2720SGL work out of the box on ESXi 5.x? I tried this several months back and could not get ESXi to recogniz the card. I only saw support for EXSi 4.x on their website. Hi, the Rocket 2720SGL is not directly usable in ESXi, it can only be utilised when passedthrough to a Virtual Machine. ESXi will recognise it as a device that can be passed though, however other than that you can not do anything with it. I have updated the blog post to state this. That is what I am doing now in ESXI 4.1. I set it up as a passthrough and is used by an UNRAID VM, I initially went down the 5.1 path but could not get ESXi to see the card. I dug around the Internet and found articles about hacking the oem.tgz and adding the RR2720 driver in 4.3 and I got it to work so I stuck with it. Might have to try 5.5 again one of these days. Thanks for the article. Hi Matt, thanks for the clarification on the 2720SGL non-raid card. Mine is the RAID 2720SGL version and does have on chip RAID controller. As per Manny’s post, I can confirm that there are NO ESXi 5, or 5.5 drivers available. I investigated using the ESXi 4 driver, but that doesn’t work, so it’s game over for native ESXi 5 use. There is a post that discusses how to compile your own ESXi 5 drivers from Linux source code, but I’d need stronger Linux admin skills to pull that one off! So without any native drivers, it does pass through and is detected by Windows Server 2012 and FreeNAS (which is FreeBSD based). I initially configured it with RAID 5, and had zero success under either OS. I am not sure if it was related to a poor RAID 5 array / creation, as the controller continually reported the array status as uninitialized and I got errors in both OS’s when I tried to write data to the volume. Also 2012 disk enumeration / listing of disks and volumes was taking well over 5 – 10 mins. I have just deleted the RAID 5 array and created a RAID 10 over four disks. That array initialised immediately. 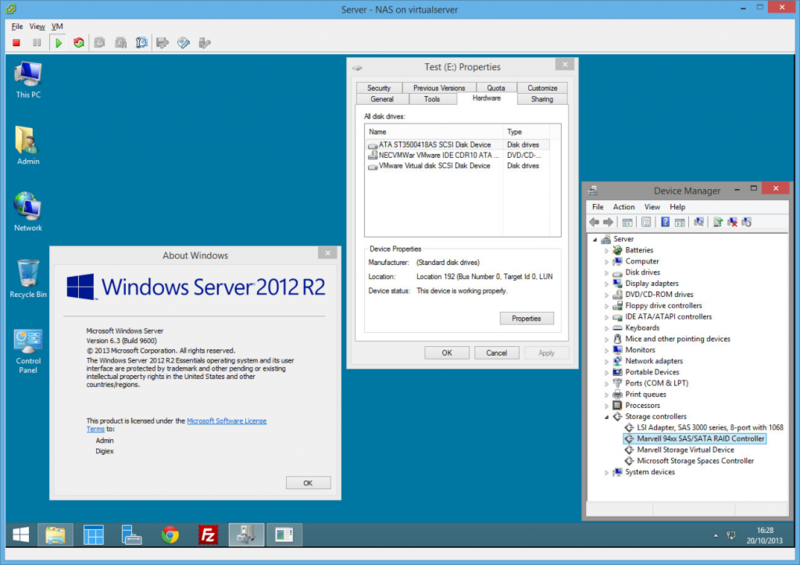 I have passed it through to Windows Server 2012 to test, and will also re-try with FreeNAS. I will post back with results for anyone interested. Thank you Matt for this priceless information. I’m looking for a controller that would passthrough from ESXi to a dedicated VM, and it’s actually very hard to know what will work and what won’t (had very little luck so far). The only thing that prevents me from ordering the board right now are some very negative comments on amazon.com which are pretty frightening. It’s more than 200€ to get the board and two SAS to 4xSata cables, it’s more than the motherboard + core i5 I bought for my new server… strange world we live in :o). What negative comments have you seen on Amazon? to be honest i don’t really read Amazon reviews, i generally find a lot of them are by people who dont actually own the product, or have no idea how to use the item in question. Amazon reviews just dont appear “real” to me, i never find myself agreeing with them. I generally read independent websites for reviews, blogs and so on. If you were to buy the HighPoint Rocket 2720SGL from Amazon UK:http://www.amazon.co.uk/HighPoint-Rocket-2720SGL-PCI-Express-Controller/dp/B007EM7N98/ it works out about $15 euros cheaper than Amazon.fr. Sometimes its worth checking out other European versions of Amazon, i saved around £90 on my mobile phone buying it from Amazon.de, the phone still got shipped from a location in the UK anyway! The cost of SAS to SATA breakout cables are very high though i agree! I was lucky the case i have for my server came with some cables anyway, so that made it easier to justify the purchase. The HighPoint Rocket 2720SGL has been really great for me however, i’ve had it passed through to a Windows Server 2012 R2 VM for around the last 7 months now, on 24/7 and the performance has been fantastic. It does what i need it to do, works perfectly with Esxi, so i really cant fault it personally. I tried this with a RR2720 in non-raid mode using Ubuntu 14.04LTS VMs and software raid. it appeared to work but over time I encounters spurious IO errors in the logs to the point of crashing the array, Its worth noting that the same disks and array worked flawlessly in a ubuntu bare metal server. I realise you used the non-RAID card but I was hoping that with ubuntu supporting the RAID card in the VM as non-RAID it should work fine. 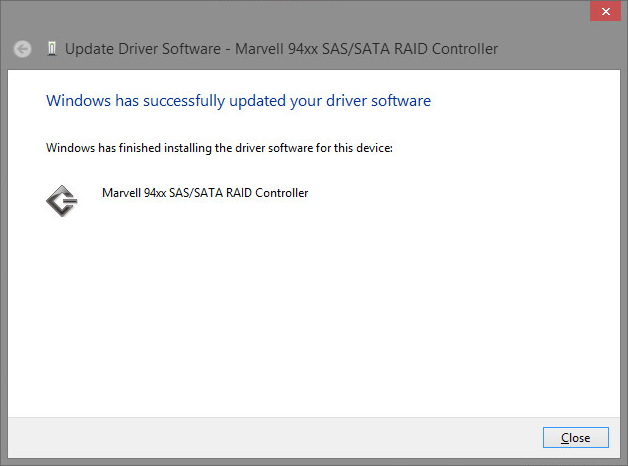 I don’t recall the card appearing as “Marvell” in ESXi though. I will have to go back and check. Perhaps the motherboard or chipset is the issue. OK I checked last night and the RR2720 card shows up as “unknown RAID controller” in VMware. I wonder if anyone can confirm whether that is due to it being a RAID version where as this blog describes the non-RAID card showing as “Marvell”. Regardless, I have found that the RAID version of the card acting in non-RAID mode under Ubuntu VM with vsphere 5.0 hypervisor is unstable and causes array failure. Perhaps I need to try vsphere 5.5 or 6.0 ? Sorry 2 years ago I promised a 2720SGL driver. I gave up on it as it was so much easier to just buy a raid controller on the HCL. I actually didn’t buy a card I just bought two Dell Poweredge R910s so I could put full size graphics cards in them. I really like the setup and suggest anyone that wants to do it to check out R910s on ebay. They are going for about 1000 USD with 128GB ram and 4xXeon processors. Really worth it. Horizon is realy nice and I can push a vm to my wife’s pone, tablet, laptop, etc. While I am using it directly via HDMI.